Seeing the dentist isn’t always an enjoyable experience. Unfortunately, it’s all too common that people feel anxiety in the days leading up to their dental appointment. Others put off their checkups due to their fear of visiting the dentist. At May St Dental Centre, we take extra steps to make sure that your time with us will help you feel relaxed and confident, even if you’ve been held back by a dental phobia in the past. From the moment you step in, we want to make sure that you feel welcomed into our warm and friendly atmosphere. Our support staff takes time to explain what you can expect, and you’ll even be sent a new patient packet of information after you book your first appointment. In our spacious reception area, you can sit and relax, sip on a tea or coffee and look through a current magazine before seeing your dentist. Each of our new patient appointments is booked in for a full hour. Though we may not require that much time with you, it’s important to us that you will never feel rushed. We start slowly by having a simple chat with you about what has brought you in. You can tell us what you’ve felt uncomfortable about in the past about visiting a dentist so that we understand how best to help you. You’ll find that our dentists, Dr Justin Ho and Dr Mark Pastorino are caring and easygoing. They will fully explain how we will proceed so that you can feel confident before getting started. Treatment only begins when you are ready and feel calm. We have a visiting dentist, Dr Brad, who can administer twilight sedation. It has the effect of putting you to sleep so that you aren’t aware of the procedure. You’ll wake up with no memory of it. 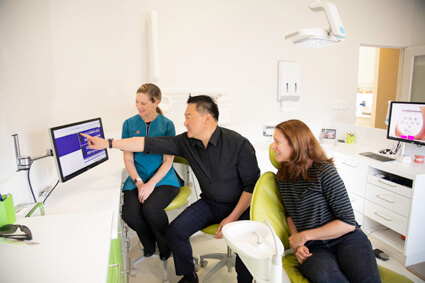 If you feel that it’s necessary, we’ll be more than happy to arrange twilight dentistry for you, perfect for anxious dental patients in East Fremantle. All health funds are accepted through our HICAPS machine. Contact our team today to schedule your first appointment! * Any surgical or invasive procedure carries risks. Our dentist will discuss all associates risks with the patient. Great Dental Websites by Smile Marketing.